I participated in an Influencer Activation on behalf of Mom Central for GB. I received a gift card to purchase a GB stroller to both facilitate my review as well as thank me for my participation. We live close to my son and daughter’s school… so close, in fact, that Jemma and I can walk to pick them up on nice days. This has been an issue in the past though. Either the stroller was too heavy and caused some issues with my arthritis OR the stroller was too small to be comfortable for Jemma. 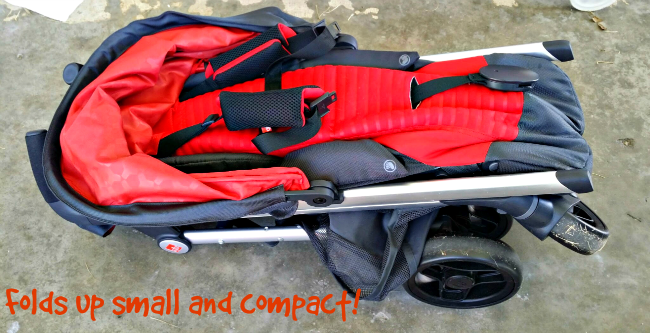 This is why, when the GB Zuzu stroller arrived, I was so happy to give it a review. When I opened the box, I was so happy with the color (called Fuzion) and material of the stroller. It is built to last and you can tell. There are a number of reasons why this stroller is a fantastic one for us and I am going to let you know all about them. Ready? Okay! Jemma and I are both enjoying the comfort of this stroller. For Jemma, she is happy to be able to recline or sit up as much as she wants. She has plenty of room for her to sit comfortably in the seat without any pressure on her legs. Plus, she has some nice padded shoulder pads on the Zuzu to keep the straps from rubbing on her neck. Finally, the canopy cover is a great size to keep the sun out of Jemma’s eyes. It gets even better though because you can unzip it and make it larger, offering a mesh breathable window extension. For me, the stroller is lightweight enough that I am not having any issues using it. 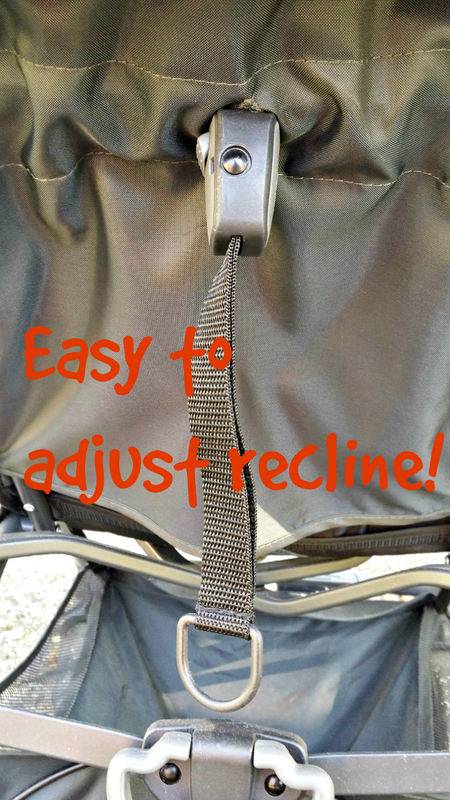 The comfortable handles make pushing the stroller easy on my arthritic hands as well. The break is easy to push (on the right back wheel) too. Oh, one more thing… this stroller was so simple to put together that I was able to do it in minutes without hurting myself! 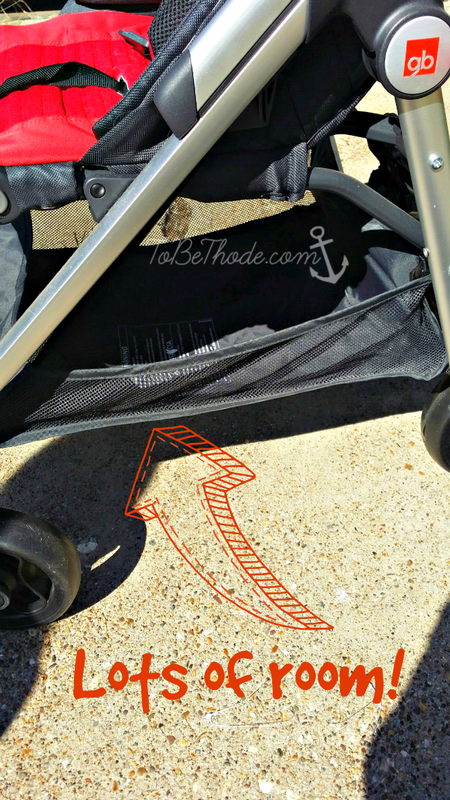 If you had a baby smaller than Jemma, you would love the ability to adjust the front of the stroller so that the legs can be kept safe from falling down. 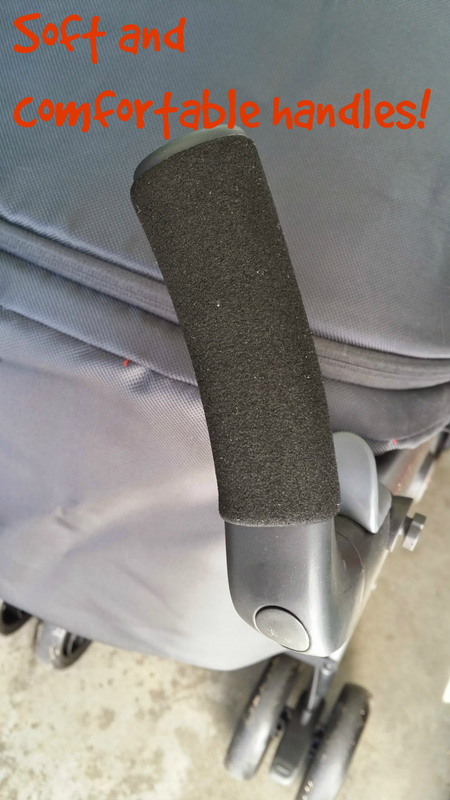 It also has the ability to attach Graco and Chicco infant seats to it, so it is also convenient… baby can continue to rest in their seat while you put them into the stroller. 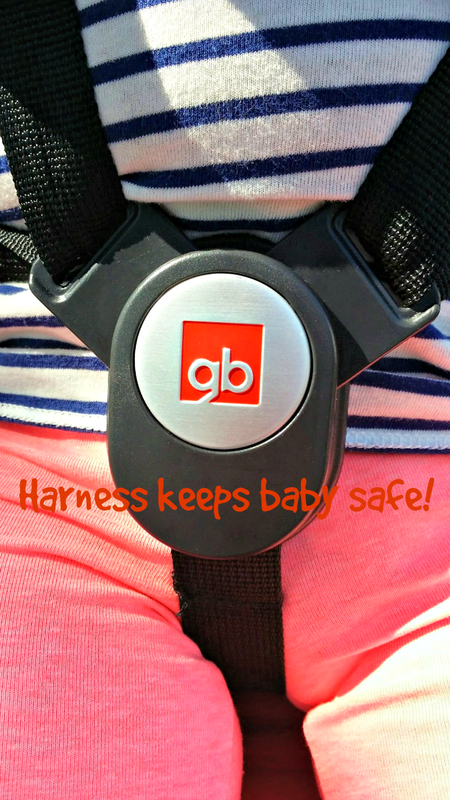 There is a harness that keeps the baby in place with shoulder straps to keep them upright. The straps are easy to adjust both in position and length. It clicks in easily and the button is easy to push and unlock the straps. I am loving the large storage basket underneath the stroller. 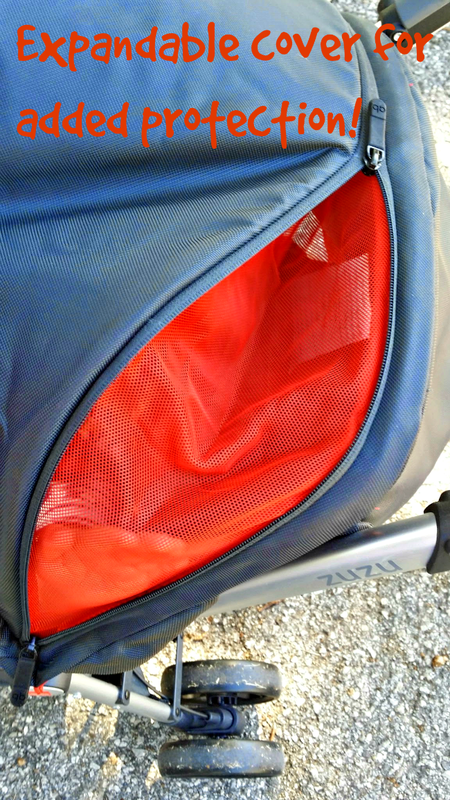 Most every lightweight stroller I have seen before the Zuzu lacked this amazing feature. I need a basket! It is a perfect place to keep my purse, keys, extra snacks, diapers, or other stuff the kids demand we bring with us. This truly is one of my favorite features because it stands out so much. 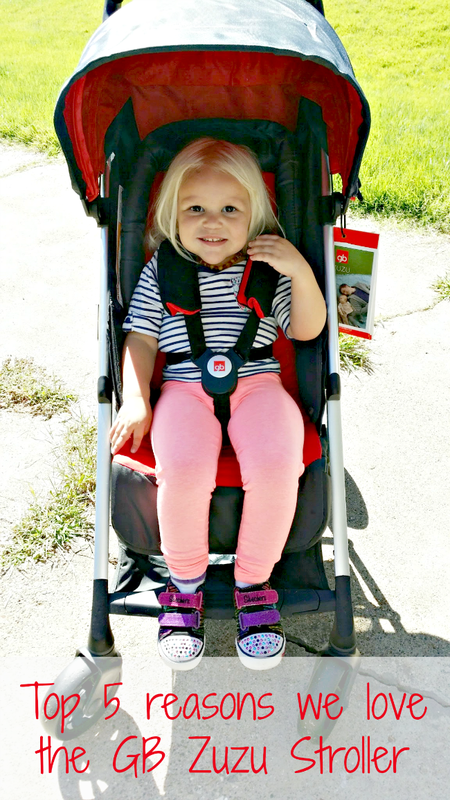 The Zuzu stroller is so easy to close and you don’t even have to bend over to do it. The handles slide down and the stroller closes while standing. It is a small, convenient size to keep anywhere. For me, it fits perfectly in my minivan between seats… completely out of the way! The GB Zuzu stroller is a remarkable price for what you get. You won’t find many lightweight, compact, and comfortable strollers at this price actually. The GB Zuzu stroller is sold exclusively at Babies R’ Us for $199.99. You can have it shipped to your house or even to the store (for free)! My only complaint with this stroller is the lack of cup holder. I carry water with me when I walk so it would be nice to have a place to put that or my phone when on the go. Yes, I can put it into the basket and that is what I will do but a cup holder would be a nice addition to this stroller for sure. The GB Zuzu stroller would make a fantastic gift for anyone you know expecting a baby or if you are on the lookout for something more convenient than what you have. As I mentioned, this can be used as a travel system or just stroller so it is perfect for infants, toddlers, and young children. What is your favorite feature of the GB Zuzu Stroller? It looks like that harness lock is easy to navigate. I like that it is too! This is a nice looking/sounding stroller! The small size is big in my book! Strollers are a pain to load and unload when it comes to the car – this one looks like it would be easy to manage! I would have to go with the idea that the child is safe so safety is my favorite feature. This is the ultimate stroller! Love the look and comfort level. And the way it folds up is awesome – perfect for getting in the car! There are lots of great reasons to love this stroller! Love the safety harness, the price, the compact fold up size and the storage! That was always a big one for me. I needed that storage. Glad the ZuZu is working out for you and your daughter! When I take any of my Grandkids anywhere, I need a light weight stroller. This sounds like the perfect one for grandparents. Looks like a super great stroller , I will have to check it out .